On Bed Frame. Removable Stainless Steel Head & Foot Bows With Laminated Panels. 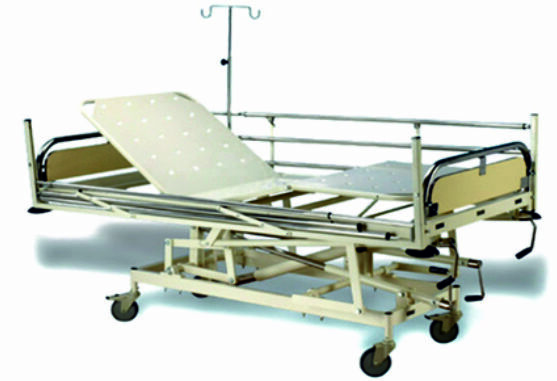 movements: Backrest, Knee Rest, Hi-lo & Trendelenburg/reverse Trendelenburg Positions Can Be Achieved By Cnc Machined Separate Screw Mechanism (corrosion Resistant Solution Treated) Fitted With Imported Bearing & Fixed Collapsible Type Handle. Urine Bag Holder At Four Locations. Four Way Saline Rod, Patient Lifting Pole, Oxygen Cylinder Cage, Patient’s File Holder.